This is a short entry. I know little of Egyptian politics, but the charts involved are interesting. 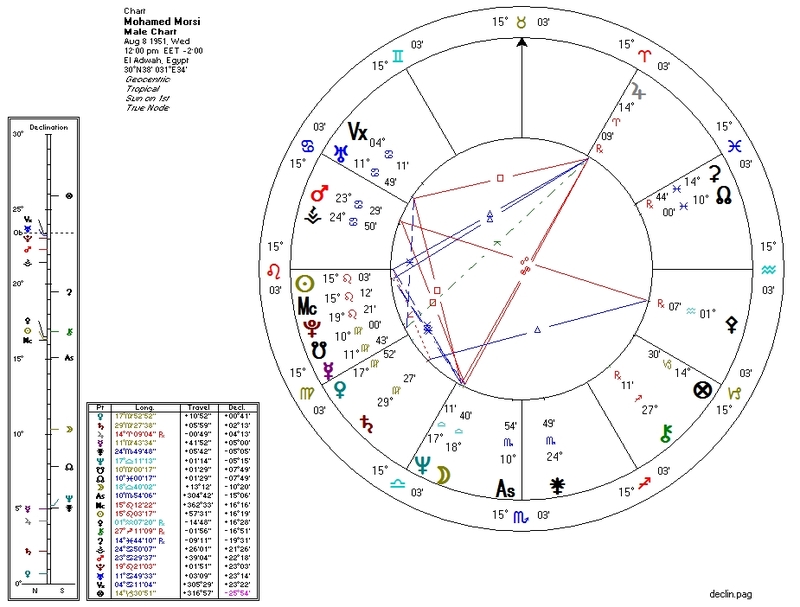 Deposed Egyptian leader Mohamed Morsi's natal chart (no time available) has Pallas parallel with the Sun. By itself, this is a strong libertarian factor. Jupiter, however, is square Uranus and quindecile Saturn, thereby blocking both of Pallas' sign rulers. So much for the parallel: this man is probably a pretty heavy authoritarian, and the Sun-Pluto conjunction can't help. The chart looks solidly Left-wing as far as we can tell without a time of birth: the South Node is conjunct Venus and Neptune is conjunct the Moon. Without knowing much about Morsi's regime, we can see from the chart that heavy-handedness and bad economic policy are likely. Good riddance, one might think. This is a chart for the day of the official ousting of Morsi. The Sun-Uranus-Pluto T-square says "revolution" like nothing else. 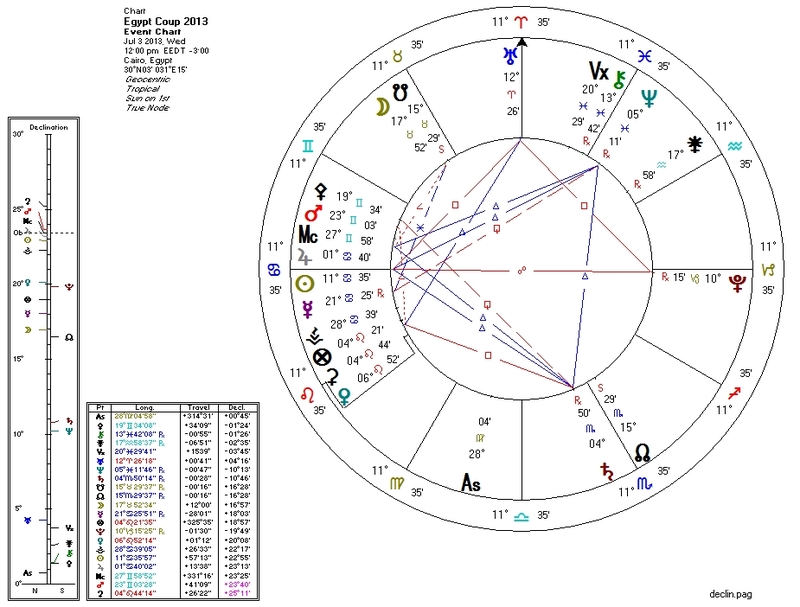 The closeness of the Sun to Jupiter and hence the Neptune-Saturn-Jupiter grand trine is a nice touch: there's some positive energy here, even if the US government, which funds the Egyptian military that executed the coup, may have actually started things behind the scenes. I've left my political analysis theory out of this one because we would need to know the actual "seed" of the coup to know its intent. One hopes that the new regime will be more amenable to Egypt than the last. And that the overlords in Washington will stop funding foreign armies and coups with US taxpayer dollars.